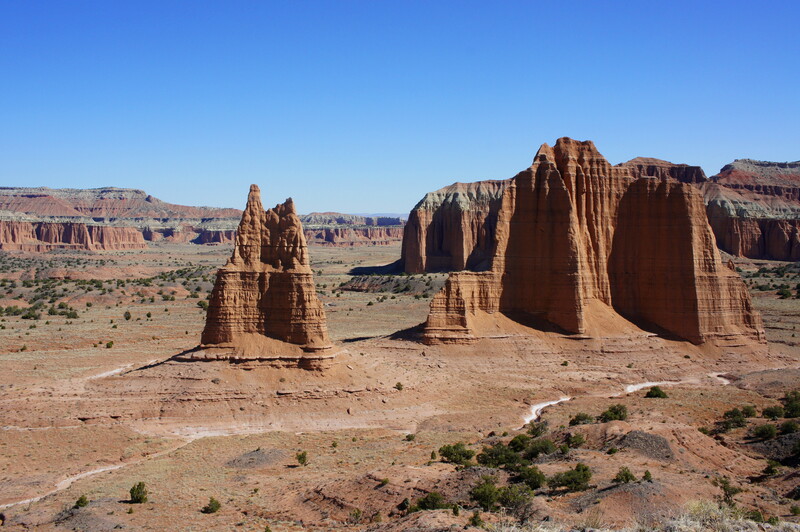 The 60-mile Cathedral Valley loop drive serves as the departure point for six short hiking trails in Utah’s Capitol Reef National Park. When completed in a clockwise direction, the sixth and final hike reached along the way is the 1.1-mile Cathedrals Trail, a well-defined and scenic jaunt through some of the park’s (and country’s) most remote territory. Following a ridgeline that parallels a series of Entrada sandstone monoliths known as the Cathedrals, this route offers stunning views in all directions. To access the Cathedrals Trail, drive 28 miles along the dusty Hartnet Road, turn right at the Hartnet Junction (toward the Cathedral Valley Campground), and continue nearly 2.5 miles on the Cathedral Road—down a group of switchbacks—to the trailhead. (Note: Hartnet and Cathedral Roads are not suitable for all vehicles; high-clearance required, at a minimum. Check with the Visitor Center for latest road conditions.) 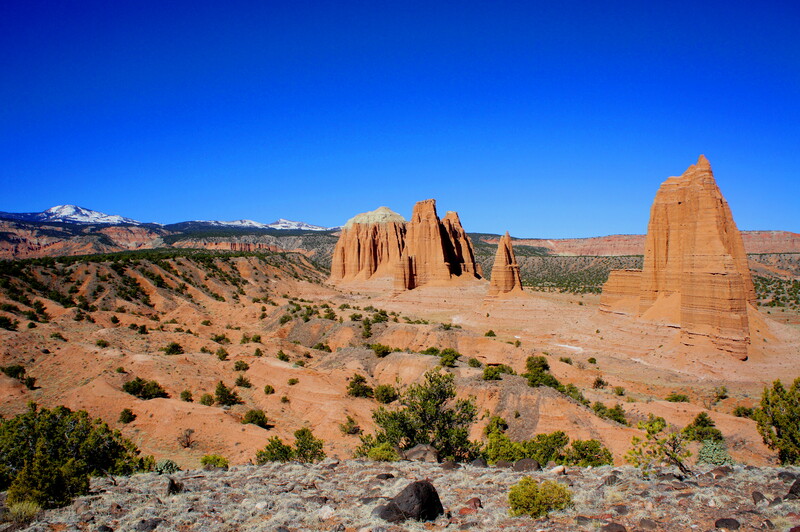 The trail starts from the floor of Upper Cathedral Valley, a juniper-speckled basin encircled by lofty, ornately-decorated walls. At the base of a small hill, look for a small but conspicuous sign on the left marked “Cathedrals Trail Trails End 1.1.” There is sufficient parking on the opposite (east) side of the road for 3-4 vehicles. 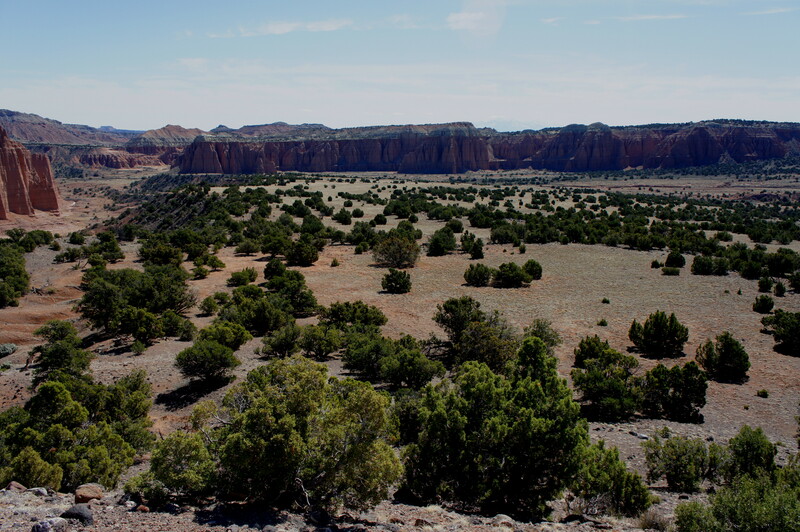 From the trailhead, the Cathedrals Trail immediately begins to climb, ascending northward amid bushy junipers and ubiquitous basalt boulders. 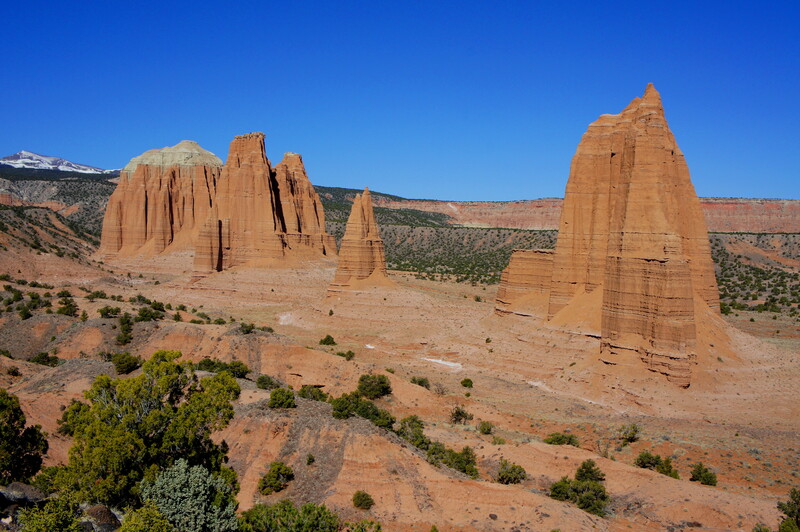 Rounding a corner, a clearing in the trees offers the hike’s first unobstructed views of the Cathedrals—a spectacular line of beautifully striated buttes and pillars. 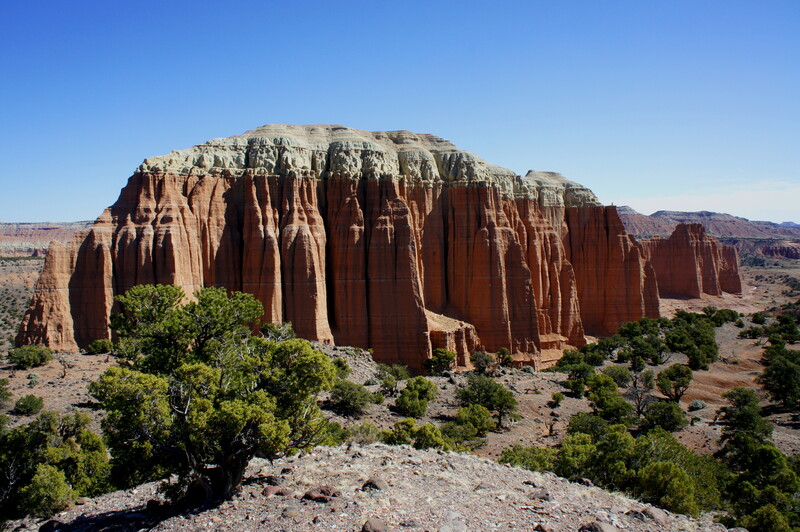 The closest is Needle Mountain, a hunk of quickly-eroding Entrada more than 200 feet thick that is free of its protective cap: the more durable, green-gray Curtis formation. On the other hand, Cathedral Mountain—the largest and most distant of the monoliths—enjoys a significant Curtis overlay. Clear of the initial ascent, the Cathedrals Trail remains relatively level for a good part of the next mile. In a number of places, the path flirts with the northern fringe of the ridge overlooking a peach-colored gully at the foot of the Cathedrals. Peeking through the troughs between the Cathedrals, bits of the multicolor Jones Bench emerge into view. Turning your back on the Cathedrals, the colorful escarpment of The Hartnet unfolds to the south, tarnished only slightly by the sight of the switchbacking road. Those with a keen eye may be able to spot Morrell Cabin, a modest cowboy outpost dating to the 1930s, situated roughly midway between here and the switchbacks. To the west, the forested slopes of Thousand Lake Mountain and the Fishlake Mountains, which often harbor snow until June, complete the frame. Having trekked from one end of the Cathedrals to the other, the trail curls around to the west side of a minor hill, then—for the hike’s finale—climbs steeply to the summit. Though arguably not the best view of the Cathedrals, the grassy knoll does provide a 360-degree panorama of the gorgeous and peaceful landscape. After a break, return to the trailhead by retracing your steps. This entry was posted in Capitol Reef National Park, Moderate Hikes, Utah and tagged Capitol Reef, Cathedral Mountain, Cathedral Road, Cathedral Valley, Cathedrals, Cathedrals Trail, Curtis formation, Entrada sandstone, Fishlake Mountains, Needle Mountain, Thousand Lake Mountain, Upper Cathedral Valley, Utah. Bookmark the permalink. Your blog and descriptions are wonderful. I had the fortune of visiting Cathedral Valley last December and it was a surreal experience. I am planning to go up there again in two weeks. Do you think it would be too cold to spend the night out at the Cathedral Valley campground? Great to hear it! Winters are normally pretty mild in Capitol Reef, but Cathedral Valley’s higher elevation will make it chilly for sure–and the road can be questionable this time of year. I would recommend playing it by ear to see what the weather looks like? Thank you Andrew. Yes, I will be checking on the weather and road conditions before planning on it.